Week 1 of the refurbishment has gone well and witnessed the removal of all of the shelving and furniture from the areas being refurbished leaving us with a large empty shell and a sense of how big the space actually is. We were also able to get the impression of how much more light will come into the space with the lower shelving and the likelihood of being able to see from one corner to the other should help to give a much greater feeling of space once the work has been completed. Much of the carpet has been lifted taking us back to the concrete floors but perhaps most interesting of all was the removal of the glass walls between the Library and the Open Access Suite. The wall between the Open Access Suite and the Café has also gone allowing us to sense how all of the spaces will work together. 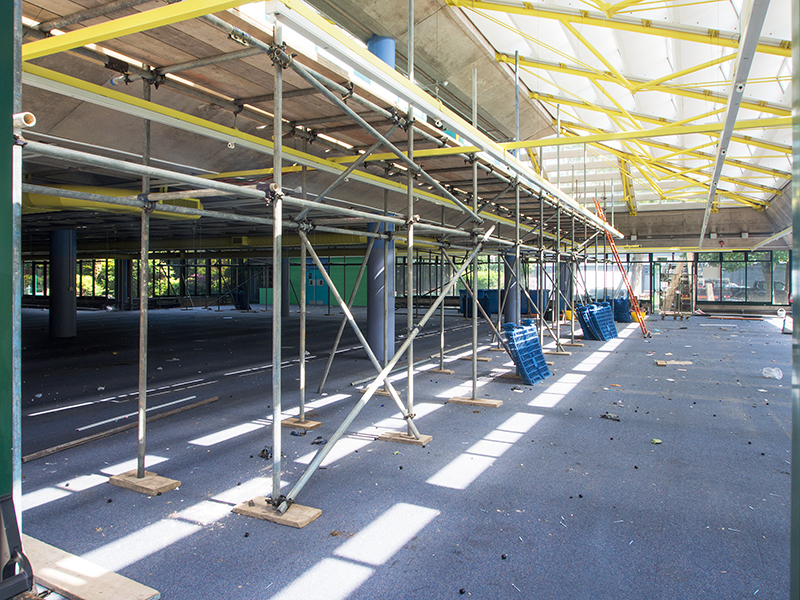 Scaffolding has been erected around the wall on the first floor that will be demolished and replaced with a new wall containing fans to cool the space below and we also have an extensive scaffolding tower to allow access to the roof. Finally demolition of the walls around what was once the short loan room and which will become the new office for the Faculty Librarians and Assistant Faculty Librarians took place over the weekend. The alternative service arrangements planned by the Library commenced on Monday 9th June and have been operating successfully and we hope that the sunny weather continues for walking around the outside of the building rather than through the building as we normally do. ‹ Chicks’ Charm Offensive is Well Underway!